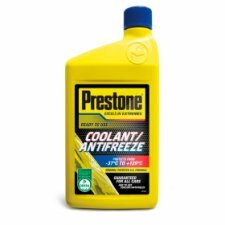 Prestone's Antifreeze/Coolant is specially formulated to help prevent freeze-ups, overheating and boil overs.The ready-to-use formula is compatible with any antifreeze/coolant and helps protect aluminium and all other engine metals. The formula is both silicate and phosphate free for long-lasting inhibition and corrosion protection. Prestone create products that are suitable for all makes and all models.